Mecontium ileus and Distal ileal obstructive syndrome (DIOS) (also known as meconium ileus equivalent) are bowel blockages due to abnormal, thick, tenacious stool. These obstructions are seen an a subset of patients with cystic fibrosis. • Present in 20% of newborns with cystic fibrosis and may be the first clinical manifestation. • Abdominal distention at birth, multiple doughy loops of dilated bowel on palpation, bilious emesis, and failure to pass meconium in the first 24-48 hours of life. • Complicated: volvulus, gangrene, atresia, or perforation (meconium peritonitis). In uncomplicated meconium ileus, contrast enema can be both diagnostic and therapeutic. (Adding an emulsifying agent (Tween 80) may enhance effectiveness). Therapeutic enemas are 40-60% effective in patients with simple meconium ileus. The risk of perforation is approximately 3%. Perforation requires operative intervention. Simple end-to-end anastomosis is preferred because the long term surgical morbidity is lower than with enterostomy. Enterostomy or T-tube enterostomy is still acceptable and preferred in some centers. • Small risk of mechanical small bowel obstructions later in life which may be difficult to distinguish from DIOS. • After 2 failed attempts of nonoperative hypertonic washout, operative intervention is may be indicated. • Enterotomy and intraoperative saline irrigation for mechanical seperation of the pellets from the bowel wall and evacuation of the meconium. Complicated meconium ileus may be due to volvulus (twisting of the bowel), gangrene (strangulation leading to dead bowel), atresia (congenital blockage due to reabsorption of a section of bowel prior to birth), or perforation (meconium peritonitis). Most complicated cases require surgical exploration. Distal Ileal Obstructive Syndrome (DIOS) was previously called Meconium Ileus Equivalent. Essentially, this is an obstruction within the lumen of the bowel by thick, tenacious stool which leads to a blockage. DIOS is in contrast to typical small bowel obstructions which occur due to kinking of the bowel or scar tissue on the outside of the bowel. Treatment often involves use of PEG solution at a low rate given under close medical supervision. There is a risk of perforation or other complications in this setting, and inpatient treatment is typical. Prevention by controlling stool consistency is key. Patients with this condition should have a close relationship with their cystic fibrosis center or gastroenterologist. • In one study, 12 % of patients with CF were affected. The majority had meconium ileus as an infant. • Frequently brought on by cessation of pancreatic enzyme replacement, dietary indiscretions, dehydration, or colds. • Conservative therapy preferred, but 26% of patients in one study required operation. • Advances in neonatal critical care, antibiotics, and anesthesia have allowed CF patients to survive longer. • Genetic studies – Delta F508 mutation associated with abdominal complaints rather than pulmonary complaints. • Chronic antibiotic use for assoc. pulmonary infections may mask the classic signs and symptoms of appendicitis. • Incidence of perforated appendix at time of diagnosis higher than for general population. • Result of colonic strictures and classically associated with high strength pancreatic enzyme replacement. 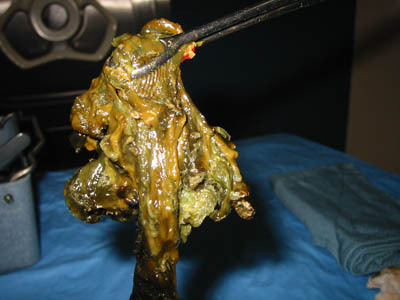 • Gross appearance of the affected colon: The lumen is thickened and narrow. The mucosa has an erythematous cobblestone appearance. • 6% incidence in one series, but reported to occur in up to 23% of the CF population. • Occurs most commonly between the ages of 6 months to 3 years. • Most managed conservatively by manual reduction. • Surgical repair indicated for significant bleeding, incarcerated prolapse, severe pain, or failure of medical management. • Tube thoracostomy or pleurodesis for pneumothorax, lobar or wedge resection for bronchiectasis, and lung transplantation. • High mortality rate in CF patients with PTX, and high prevalence of history of PTX in those patients who died. • Lung transplant only therapy available for those with end stage lung disease. • The donor lung does not carry the CFTR gene. • Incidence aprox. 81% in patients younger than 5 years old. • Children unresponsive to conservative therapy should have Nissen. • Aprox. 1% of patients with CF. • Abnormally thick stools adhere to the bowel wall and may act as a lead point. • Improved antibiotic and pancreatic enzyme therapy.